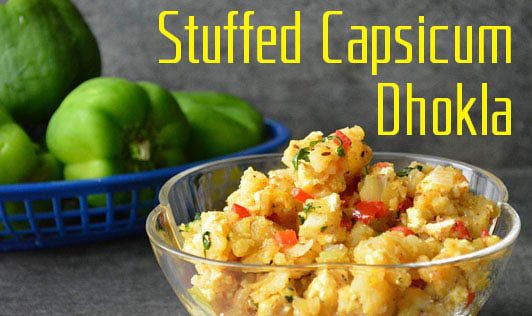 Give a twist to your typical dhokla by stuffing it in capsicum. To make the khaman batter, mix all the ingredients together using enough water, except the fruit salt to make a thick batter and keep aside. Cut the capsicum vertically into halves and deseed them. Boil enough water in a steamer. Add the fruit salt in the batter, mix well and pour them into each capsicum and steam them in a steamer for 10 minutes. Prick the dhokla with a tooth pick to check if it’s done. The tooth pick should come out clean. Let the capsicums cool. Once cooled cut them into 2 pieces. Heat oil in a non stick pan, add mustard seeds, when they splutter add the sesame seeds, hing, and curry leaves and sauté for a minute. Add the capsicum stuffed dhokla and sauté for 4 to 5 minutes. Always mix the batter with hands to break the lumps if any.